Patrick McIntyre co-hosts Autoblog's epic auto-adventure series The List: 1001 Car Things to do Before You Die, with Jessi Combs. The List, which is essentially the ultimate automotive to-do list brought to life, features two very different personalities. Jessi has been into cars since a very early age, and now is a pro metal fabricator, accomplished off-road racer, and officially the Fastest Woman on Four Wheels. Patrick has had a different career arc, starting out in improv comedy and winding up on the auto show circuit as a presenter. Each episode challenges them in different ways, and that makes it all the more fascinating. Now that this season of The List has wrapped, we decided to check in with Patrick and find out even more about what makes Autoblog's wish-fulfillment video series work. Autoblog: Tell me a little bit about yourself. Jessi said that you're an improv comedian as well as being a host? Patrick McIntyre: Yeah, my background is primarily on the performance side of things. I co-own a comedy theater in Santa Monica, California, and we've been touring the country for 15 or 16 years. What I was doing [in] improv comedy kind of transitioned into the auto shows, which is where I started to gain a real appreciation for vehicles themselves and for the people who love cars. You travel around the country and get to basically just shoot the [breeze] with people who talk about cars all day long. It's a fun way to get a taste for the automotive world, which I wasn't aware of prior to working with the auto shows. What does your improv background bring to the show? When it comes to The List, we have a rough outline, but the better moments are the ones that are unplanned. Especially when you deal with automotive stuff, a lot of times things can go unplanned because there's human error involved. I think what [my improv experience] brings to the table is an understanding of how to convey what's happening in the moment ... being able to completely go with the flow, and no matter what happens. 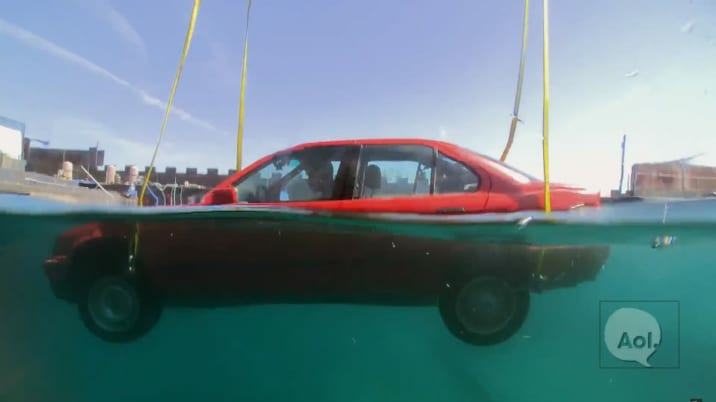 I would have to say the most fun would be [Episode #0147: Escaping from a car] under water. It was by far one of the most terrifying things we did, but also was just fun that we got to play with something that would [normally] be a life or death situation. There was an added element of danger that didn't involve [a] car going 100 miles an hour. We got to act out the scenario, and we got to enjoy ourselves, [in] safety. 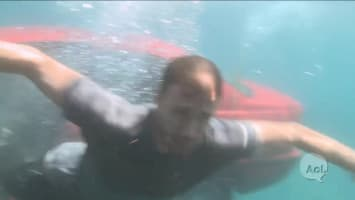 It was also cool because it felt very Hollywood, in the sense that we got a big crane out and had this whole production of lowering the car into the water – what you imagine when you think of viewing a TV show. Our show is almost always just a couple of us: Graham, our producer, and our cameraman, usually Chris, and a sound guy. That's it. I think people would be impressed if they realized how few of us there actually are doing [an episode]. I know that you and Jessi get along, but is there also some competitiveness? I'd love to say that we love to fight over who's going to go faster and whatnot, but it's been more of a personal challenge for each other. I think Jessi likes being competitive in general. But for my sake, I think she puts on a little layer of competitiveness to push me. That makes me perform better. How would you describe your growth? I can't imagine doing as many episodes and all the wild things you've done and not being changed as a person. Yeah. I have absolutely changed, in the sense of now knowing what is possible to do, and also learning what the limits are. I think that karting was a great episode for me personally, because I felt like that was a time when I was comfortable pushing the limit on that vehicle. The stakes were just low enough, and I was able to really push myself past that comfort zone. Do you think the show's made you a car guy? Do I lust after a lot of the cars? Not so much. I do lust after the experiences, though. I wouldn't call myself quite totally a car guy yet, but I'm getting there. I think it's good for the balance of the show, seeing someone like me who is just getting in the wheel for the first time. I think that's a good blend of the two, the everyman alongside the go-getter woman in this case, Jessi, who is somebody who I trust 100 percent when it comes to these cars and her abilities. What's a strange or unusual experience you've had on the show? I think the fun thing about automotive adventures and sports is that to be able to do these [episodes], you need to be out in the middle of nowhere. For the Morocco episode (The List #0025: Compete in the Rallye Aicha des Gazelles), we had to go to the desert. Unfortunately, the producer Graham and I had to leave Jessi – she was already racing. I got to see things in Marrakesh within the souk, which is the city center, which I never would have found on my own, as a tourist. It was just the two of us – Graham and I. We traveled hours, maybe 6 hours or more from the city into the middle of absolutely nowhere to see this amazing setup of people and women and support teams all working together. Just to be a part of that alongside of it was incredible. How much work is it to capture segments in these hostile places? I don't think people understand what goes into actually shooting ten minutes [of the show]. When you look at ten minutes, [you don't see] how many times the cameras broke and a lot of struggle that people don't see. There is a lot of trying to get things just right for those cameras, and a lot of times we don't, and sometimes when we don't get it right that's when we get the best stuff. So you're doing it live, in a sense. Yeah, we absolutely are. I remember the first ... When we raced in Baja, which was maybe the second episode we did. We walked away with hours and hours and hours of footage. If the camera's not rolling and something happens, you missed it, and the whole point of you being there was to capture it. Sometimes we have to do more than is expected in order to get the best stuff we can. What thing that you've done so far on the show do you most want to go back and do again? I would love to go back to high performance driving school again. 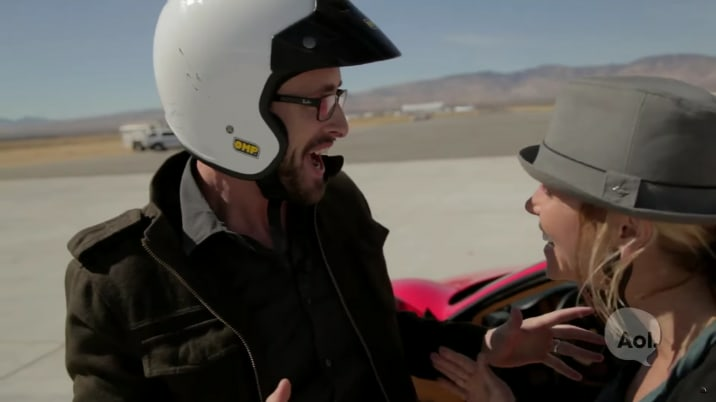 Skip Barber was the very first episode we did, and it's one of those things... It's the same as your first kiss or the first time you go on a date. You look back and go, "If I would have done this, or I would have known this at the time, it would have gone so much smoother." At the time it really was kind of like, "Here's a BMW M3. There's the track. Have fun!" Obviously the instructor knows what to do, but at the time it was just so overwhelming. You can't go for an hour. You need to go for a couple days to be able to get comfortable and really learn. I feel a lot more confident now. You're talking about a guy who got into the Lotus and stalled it immediately. This was the very first day of shooting. It's the first thing we shot. I've got Jessi next to me, I've got cameras on me. Everybody's watching, and I've never driven a Lotus before, and the first thing I do is stall it out. I thought, "Here we go. It's going to be a long day." Last question. Did Jessi ever tell you how she beat you in the Soapbox Derby race? When you get down to the bottom of the hill, there's a group of guys there and they pick up the soapbox cars and they put them onto a trailer and then they drive them back up to the top. Typically, I would help [Jessi load her car], but when I went to go get her car, she was like, "No, I got this, I got this." She put it up with one of the other guys. It wasn't until all the cameras were off that she was like, "Okay, I had a little weight in there, sure." Well, Patrick, thanks so much for talking to us.